Originally from Michigan, Tajma Stetson, now lives and entertains in Kansas City. When asked how she was introduced to female impersonation. Tajma replied "My best friend was performing in drag when I was still a teenager and it interested me. I had always been a creature of the theatre and thought that female impersonation was a wonderful extension of that community." 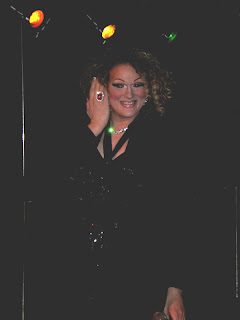 When she started drag, Tajma was reared by what is called a "drag family"--the Stetsons. Her mother was Shania Stetson, and her grandmother was Sierra Stetson, along with several aunties from different families. The collaboration of these entertainers came up with Tajma. "I was always on stage as a kid--at school, at church, in front of large audiences, and sometimes just a mirror. Even in college I was part of a touring professional theatre company." By the time Tajma moved to KC, she had be doing drag for 3 years and always knew that she wanted to compete. It was at this point that several of her new KC girlfriends and one very influential former Miss Gay Missouri encouraged her to enter a city prelim. "The rest is history still being made!" "My favorite part of competing is being a part of a huge sisterhood that encourages me, educates me, makes me want to grow and be a better entertainer and person." Tajma Stetson's former titles include Miss Gay Congeniality 2009, Miss Gay Kansas City 2010, and Miss Gay Metropolitan 2011. 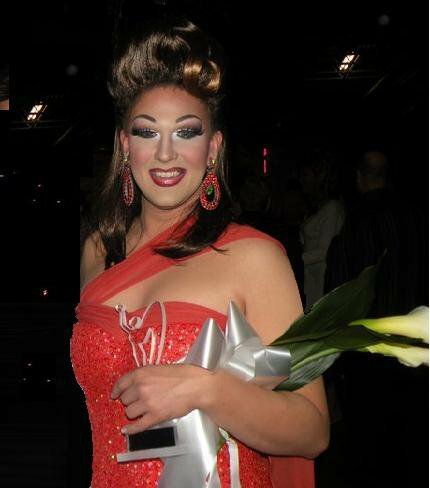 She also was a top ten finalist at Miss Gay America 2010 and a top five finalist at Miss Gay America 2011. Tajma's upcoming pageants include Miss Gay America 2011. Best of Luck to you! The Queen's Envy thanks Tajma Stetson for the information provided for this blog! I am from Michigan too!!! Go Girl!! I grew up in Romeo and then lived in the Metro Detroit area........one of my best friends Todd used to do Drag when he was younger..now he is a big teddy bear...he is a comedian! We live in Florida and we used to work together and people always thought we were weird....so we would look at each other, then look back at them and say," Honey, its a Michigan thing!" hahahaaa! Us Michiganders have our ways and everyone else is...a little different! hahahaa! You are beautiful.